A good working space is a crucial component at work and at home. 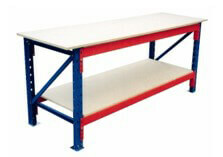 Our workbenches offer you a safe and tidy working area. You can also store unused tools and equipment while you labor at an organized area. If you’re looking for strong and sturdy workbenches for your heavy or light tasks, then look no further, we make them to suit your work and storage requirements.